"Embracing the rhythm of love that's exactly the same as the beat of your heart." Some say the eyes are the window to the soul. I'm inclined to say language is the door. 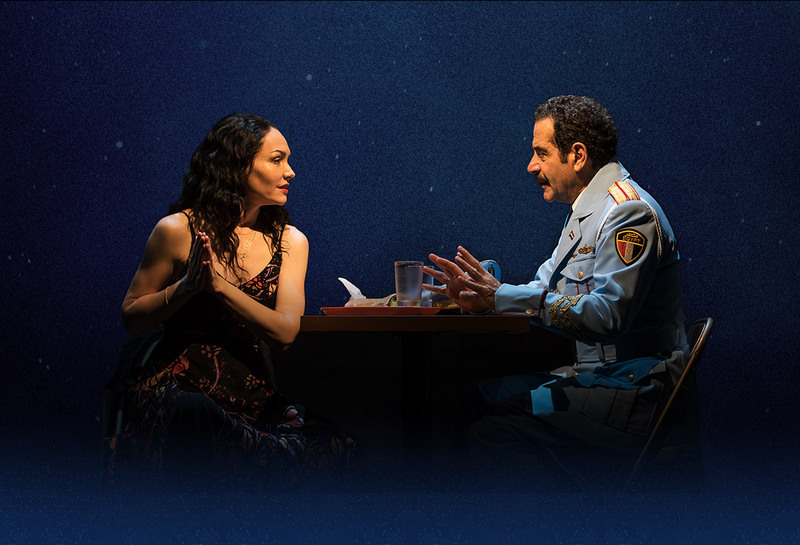 The Band's Visit is not your typical Disney musical, nor is it a deep delve into the human condition. Rather, it's a snapshot of everyday life. The audience gazes into a window - like a snow globe filled with desert sand instead of confetti - and by peeling back the curtain obtains a glimpse of simplicity. We're not bonked over the head with themes of forbidden love, the questionable origins of evil, or the basis of the US political system. This was refreshing. I didn't walk away feeling like a terrible person who needs to fundamentally address my shortcomings (though myriad), nor did I leave disheartened at the state of the world (though, admittedly, I'm always in the market for art about contemporary politics). I left struck by the amount of silence. When I lived in Florence, Italy for 10 months in 2007, silence became my tool. It unfurled in a space where I could listen, absorb, observe, and sculpt my mouth over rolling R's and the particular sound of the word "gli" (something about moving your tongue over the alveolar ridge just behind your front teeth and adding a "y" - easier done than said!). My proudest moment arrived in front of an 11lb jar of Nutella. I stared at it quietly, then laughed. When the shopkeeper said, to my face, in Italian, "Gli stupidi Americani vengono a comprarlo! Come possono tornare sull'aereo con esso?? *" I knew I could pass as a native. Not because I talked, for that would give me away, but because I stayed quiet. My lack of language meant blank stares, getting lost on the train to Fiesole, and waiting for over an hour at a restaurant because I didn't know how to ask for a check. But most of all, it necessitated bluntness. Need something? You must ask in the most blatant way possible. In The Band's Visit, a group of Egyptian musicians accidentally arrives in small town Israel. This town, colorfully decried by the locals as "Basically beige and black and blah," has nothing to offer but real life. An unemployed father struggles to maintain his marriage, a teenager confronts the travails of his young heart, and a lonely woman looks for love in all the wrong places. Unique to this show, however, is language. 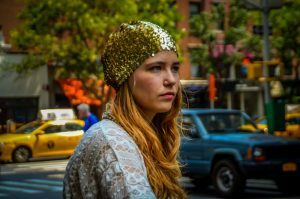 The common tongue is English, though characters often drop fragments of Arabic and Hebrew that are frustratingly untranslated for the audience. Consequently, we understand that some nuance is simply incomprehensible. Speaking a foreign language reveals a lacuna of nuance. The accumulated detritus of social conditioning and politeness is obfuscated by sheer necessity of communication, and in The Band's Visit this bluntness is refreshing. Dina, a lonely Israeli woman played beautifully by Katrina Lenk, and Tewfiq, the Egyptian band leader stunningly embodied by Dariush Kashani, teeter on the edge of a fleeting yet endearing romance. As he conducts an imaginary orchestra of waves and sea foam we expect this comforting love story to leave saccharine feel-good vibes. Instead, we learn that Tewfiq carries heavy guilt for his son and wife's deaths, and this presents an insurmountable barrier for future intimacy. Could this reserved and polite man - hailed by Dina as "something new I didn't notice I was hoping for" - ever make this admission to a complete stranger if he spoke his native tongue? I'd argue no. His reservations would rise like bubbles from underwater volcanoes. I believe language is the door to the soul. Fluent, poetic musings of Oliver Sacks or Walt Whitman transcend language to become art, bursting through the door like raucous and exuberant children. Blunt questions about a wife's death push it open on creaking, rusty hinges, and elicit deep meaning purely because the words are simple. Speak the way you want, sing the way you want, but occasionally listen with the ears of another language. "Will you answer me," the final song asks. We will, we can, with simplicity. * "The stupid Americans come to buy it! How can they get back on the plane with it??" Electronic Music Design by Billy Jay Stein and Hiro Iida for Strange Cranium, Inc.